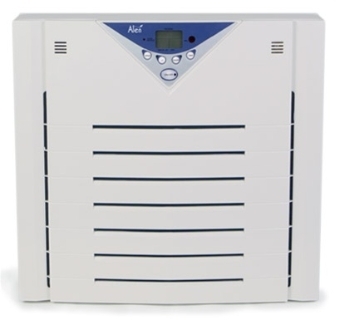 The A375UV air purifier does it all - it removes bacteria, odor, dust, pollen and VOCs. Big on performance but small price and size! The Alen A375UV air purifier has it all - literally! The A375UV air purifier has HEPA filtration, two ultraviolet lights, an ozone-safe Ionizer, an activated carbon filter and Photo-Catalytic Oxidation. The HEPA filter in the A375UV air purifier has been tested to remove 98% of airborne allergens like dust, dust mites, pollen, mold spores and pet dander. The Ionizer in the A375UV air purifier has been proven in clinical studies to promote a healthy environment. And the A375UV air purifier has not one but two UV lights which have been tested to eliminate 98% of bacteria and viruses. Pesky odor is eliminated by the activated carbon filter in the A375UV air purifier. What makes the A375UV air purifier best in its class is its PCO technology which eliminate harmful VOCs. (VOCs are the vapors that items like glue, formaldehyde and some aerosols emit and they are bad for you.) The Alen A375UV Multi Gas HEPA removes those invisible yet harmful fumes so you can breathe clean air and at a price that helps you breathe a bit easier too. Pre filter / HEPA air filter in the A375UV air purifier tested to remove 98% of airborne contaminants in rooms up to 800 sq. ft.
A375UV air purifier includes Photo-Catalytic Oxidation technology to reduce the levels of VOCs. Unit Size: 18.5" x 8.23" x 17.48"
Unit Packaging: 21.42" x 9.92" x 20.24"